When will Christ followers stand up and say, “Enough!” When will we stop bowing down to the NRA idol and take a stand for the peace of Jesus? Our citizens and children have become soldiers in an invisible war – one we are unintentionally fighting in our own streets, our own school yards, our own back yards. We need to stand up and say, “I want the right to live in a culture of safety. I want the right to live in a society unafraid. 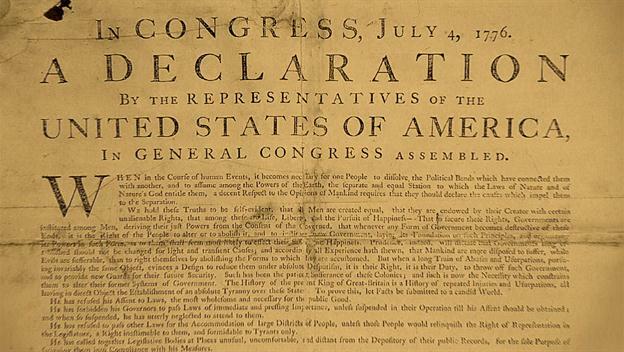 We hold these truths to be self-evident, that all men are created equal, that they are endowed by their creator with certain unalienable Rights, that among these are Life, Liberty and the pursuit of Happiness – That to secure these rights… it is the Right of the people to alter or to abolish, and to institute new Government, laying its foundation on such principles and organizing its powers in such form, as to them shall seem most likely to effect their Safety and Happiness. We are the only industrialized country that continues to make firearms available to its citizens. Other countries scoff at our rising murder rate and equivalent rising household gun rate. Our insistence on arming ourselves does not provide safety, yet we continue to turn a blind eye to the truth. How long will it take for us to figure this out? When will we have eyes to see and ears to hear? When will we ever learn? As a Canadian I really can’t figure out why Americans prefer to put gun ownership ahead of the lives of their children. That said it is a democracy so the majority rules – and so be it. It is a democracy, Paul. Trouble is, the NRA (National Rifle Association) is a powerful lobby in Washington with lots of money. They pay for lots of advertising campaigns based on fear. That’s what’s so sad about it all. The big problem is mankind in general don’t learn from past mistakes. How many have died in these tragedies but people are more concerned about “their rights” than having the problem dealt with. We are the only industrialized country that continues to make firearms available to its citizens. Other countries scoff at our rising murder rate and equivalent rising household gun rate. As an Australian I just don’t understand the need for so many regular American citizens to need to have guns in their homes. Sure there have been shootings here in Australia too but no where near the same extent or frequency as we hear of in the US. Gun ownership here is strictly controlled & very few people here are concerned about the need to have a gun for protection of their home & family. Trust me, Tony, I don’t understand it either. And you’re right, we don’t learn. We repeat them and dig in our heels and insist on having our way, even though the outcome is predictable. It makes me sad. My neighbor awakened to a strange man tapping at her door this morning at 4 a.m.. She lives alone. This person continued to roam our rural neighborhood where there is NO police protection or presence. The ONLY protection she or any of us has against a rising crime rate throughout the nation is our weapons!! It took the police exactly 30 minutes to answer the 911 call from my neighbor. Their only usefulness is to draw the chalk outline of the victim. We must defend ourselves!!!!! Bad people do bad things with whatever they can get their hands own. It only took box cutters used by terrorists to take down buildings and planes. The airplanes were the actual weapons. Did we ban flights? Do we ban machetes like what was used on a British citizen in broad daylight by terrorists’ warped loyalty to a false god? Do we hire unarmed security like was employed by the school that had the latest killings? I liken that to sending a soldier to war without his weapon. Who wins? Not so long ago, you would never have heard of what is going on now in our nation’s schools. What happened??? Did the guns get up and unionize an action against mankind? NO. It is a change in the people. It is a change in the schools. Guns have been around a very long time. It is not the gun that is the problem it is the person using it. it is society that has become more tolerant and permissive without stressing the consequence of any immoral action. OH NO!! did I dare say “immoral?” Did someone get their feelings hurt by my insensitivity…my observation of a spoiled generation…my political incorrectness? There has not been discipline in schools for a very long time. Our culture has only gotten worse and with that comes the crime of a degenerate society. Your answer to the problem is to punish the people who will be victims if left defenseless. As the bumper sticker says: When guns are outlawed only outlaws will have guns. While everyone is outraged by the horrendous killings in our schools….they have forgotten that had any of the victims/staff/personnel/ been armed it could have altered the outcome considerably. And when our good citizens are unarmed and vulnerable then the criminals win. Why not strengthen the laws that keep the criminals off the streets? Why not give them harsher punishment when they are convicted? Why not have psychological testing for everyone who seeks gun ownership? Why not try to understand that mental illness is real and is usually fueled negatively by the very medications prescribed to treat it? Why not try to understand that there is real evil in the world and that the enemy is lurking? Because of the immorality of a nation many of whom live peaceful lives may one day have to face the enemy right in their own homes, and most would rather be armed than dead. Dead Christians cannot spread the Good News. To me, immorality is arming more citizens. Immorality is choosing to have an armed society where the danger of incidents like the ones mentioned above happen more and more frequently. I agree we are fighting a war, and it’s the one I have defined in this post. Frankly, I am more afraid of being shot by someone who has obtained a LEGAL firearm than I am by a criminal. I am more afraid of being shot by someone who has become angry and decided to use that LEGAL firearm because he or she has no self-control than I am of being shot by a criminal. I am more afraid of being shot by someone who takes their angry rant of words into action with their LEGAL firearm into a random crowd of people than I am of being shot in my own home by a thief. I have a RIGHT to be outside and be safe; to drive my car on the highway and be safe; to live next door to a high school and be safe from random shootings by people who own LEGAL firearms, but who possess no self-control. I’m happy to take my chances without a gun. No, Jesus wasn’t a doormat, but He did tell us to love and pray for our enemies; He never told us to shoot them. The error the first century zealots made was thinking Jesus would become leader of their army and kill all the Romans who persecuted and occupied them, who were immoral and did not believe in God. Jesus never came to do that! Jesus came to save, to bring the Good News – and we are expected to do the same. He told us His followers would we known by their love for each other. Does shooting one another accomplish that? Does arming ourselves spread the Gospel of love and grace? Somehow, I don’t think so.